The boys have been keeping busy with speech and occupational therapy this summer. In OT, I requested that they work on feeding issues, specifically feeding themselves with spoons and using straws to drink. Zack can use a spoon, sort of - he can dip it into applesauce or yogurt and eat whatever sticks to the spoon. I wanted him to hold the spoon properly, upright so that everything loose doesn't just spill off of it. And I wanted AJ to use a spoon. He won't do it at all. Notice I didn't say he can't do it. Anyway, I got a note from the occupational therapist yesterday that Zack is doing well with using a spoon, but he needs it to be a special, plastic spoon from the baby aisle at Target, and a deeper bowl. She suggested I go get some of those spoons. Now a couple of years ago, I'd have been thrilled and I've have run right out to get them. Today, however, my expectations are higher. I want him to use regular spoons. Any old spoon I might find. He's eight. I don't want to go buy more plastic spoons from the baby aisle at Target. I already spend too much time in the baby section of Target, for a mother of two eight year olds. And I want him to be able to eat applesauce out of any old bowl I find. One day all the bowls and spoons he usually uses were in the dishwasher, so I gave Zack some applesauce in a measuring cup, with a regular spoon. He looked at me like I'd grown a third eye. Is it too much to ask that I not have to get special adaptive silverware? I appreciate her trying to help, but this isn't want I want. 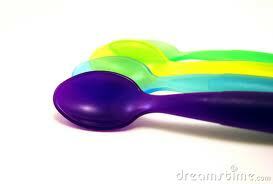 I need to find a nice way to say "No lady, I don't want to buy any more baby spoons. Get him to eat with a regular, ordinary spoon. Put away the baby spoons." And while you're at it, see if you can get him to stop acting like I'm trying to poison him by putting a straw near his mouth.